Hospice of Southwest Ohio provides care in your loved one's private home, allowing them to continue living in a familiar space. Our Patient Care Center located in Madeira, Ohio provides short- and long-term, 24-hour hospice care. We provide care in a number of healthcare facilities, allowing your loved one to stay in a familiar and comfortable space. Many people need additional help, have an event they need to attend, travel requirements or just need a little break. We’re here for you. People who are diagnosed with an acute or chronic serious illness go through a lot of stress. Palliative care provides support for those suffering from pain or other symptoms of chronic diseases. People who are diagnosed with an acute or chronic serious illness can suffer from pain as a result. Palliative care focuses on providing personalized support for these patients, helping them reach a higher quality of life. We provide compassionate care for those with life-limiting health conditions and incurable illnesses. The main focus of hospice care is to relieve pain for those in the last six months of life. Hospice care focuses on comfort, rather than a cure. Hospice is not just a location — it’s a service available virtually anywhere it’s needed. Hospice of Southwest Ohio offers services in patients’ homes, skilled nursing settings, assisted living communities, hospitals and at our Care Center in Madeira, centrally located in Cincinnati, Ohio. Our Care Center, centrally located in Cincinnati, provides short-term respite and residential hospice care. 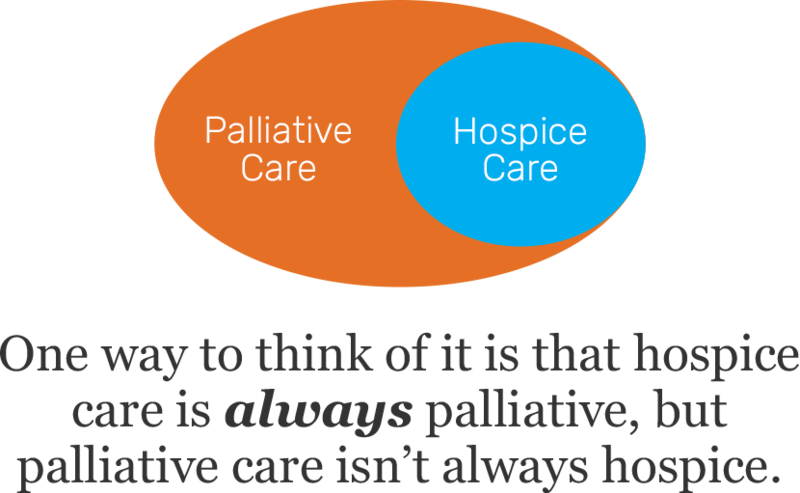 It’s easy to confuse hospice and palliative care, as they are quite similar. While the main focus of each is to ease the symptoms of incurable illnesses such as cancer, heart disease, lung disease, dementia, kidney failure and more — hospice care is typically reserved for those with less than six months to live. Looking for relief from pain and distressing symptoms? Discover more about palliative services with CareBridge Primary and Palliative Care of Cincinnati. Learn how the team at Hospice of Southwest Ohio can help make life more peaceful. Serenity, offered where the patient is most comfortable. Hospice of Southwest Ohio is dedicated to providing comfort. Whether it’s at home, a senior living community, a hospital or our Care Center, we offer hospice care wherever your loved one calls home. Interested in learning more about hospice care? The Hospice of Southwest Ohio team is more than happy to help. Fill in our contact form or call us, 24/7, at (513) 770-0820. Our hospice referral fax line is (513) 770-0313, and our palliative fax line is (513) 528-8151. ©2019 Hospice of Southwest Ohio. All rights reserved.